338 p., 4 ill., 14,8 x 20,5 cm. 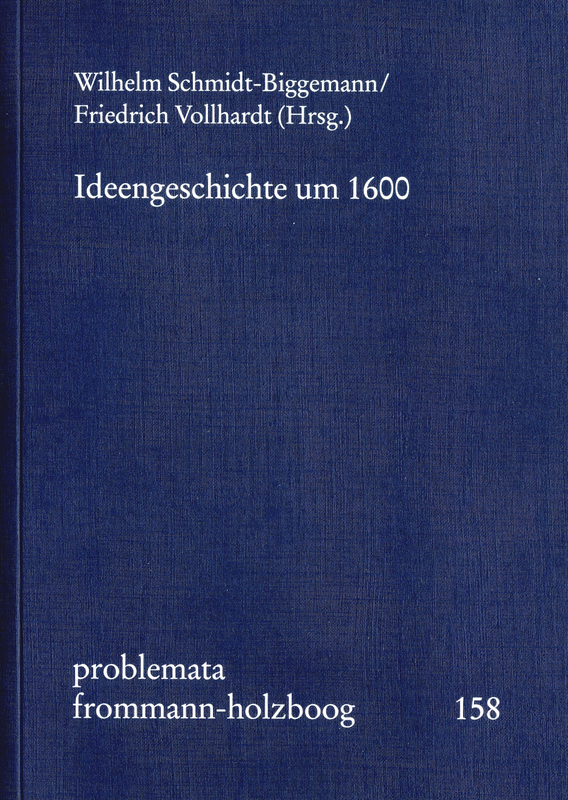 With contributions by Günther Bonheim, Norbert Brieskorn, Wilhelm Kühlmann, Cecilia Muratori, Claudia Olk, Sascha Salatowsky, Wilhelm Schmidt-Biggemann, Johann Anselm Steiger, Gideon Stiening, Friedrich Vollhardt and Volkhard Wels. During the decades around the year 1600, Europe is characterised by frantic scientific and religious activity. Religious denominations are anything but stable, while churches and nations deploy all the political means at their disposal in order to prevail against the centrifugal forces that afflict them – for below the level of institutionally entrenched powers, a dynamic potential of ideas that refuses to submit to dogmatic stabilisers continues to exert its influence. Its central, long-lasting topoi originate from Florentine hermetic Neoplatonism, late medieval apocalyptic literature and the Reformation. It is only against the backdrop of these historico-theological expectations in regard to the redemption and ultimate completion of nature that intellectual phenomena like Paracelsism, Valentin Weigel’s and Jakob Böhme’s natural theology, Giordano Bruno’s pantheism, the flowering of Christian Kabbalah as practised by Heinrich Khunrath, Robert Fludd and Athanasius Kircher (which in turn coincides with the impact of the Corpus Hermeticum), the long-term success of Johann Arnd’s True Christianity as well as the effect of Johann Valentin Andreae’s Rosicrucian writings can be properly understood. Erupting politically and theologically in the Thirty Years’ War, these tensions will have a lasting influence on the course of German history due to the absence of a nation state capable of resolving them. This holds true not only for the realm of politics, but also for the history of ideas; the long-term effects of these tensions extend via Pietism to German Romanticism and beyond. This volume is the first attempt to provide a panoramic summary of intellectual history on the eve of the Thirty Years’ War. On top of characterising these phenomena as instances of »Late Humanism,« this survey not merely describes the formal conditions of learned interchange (letter culture, respublica literaria, orientation towards antiquity), but also renders visible relevant structures in fields as diverse as theology, natural philosophy, cultural history or the history of ideas, structures which clearly suggest that the years around 1600 can be regarded as a period of its own with a distinct and specific profile. Günther Bonheim: Jacob Böhme – ein Naturmystiker?